how many years of JROTC completion the CAP cadet should be credited with. per month up to the Mitchell Award. per month up to the Earhart Award. Can this apply to USNSCC and YM, everyone in my Squadron doesn't know the answer to this question. Nope. You might get encampment credit for sea cadet summer training if you get your leadership to do the legwork for you. No ribbon, just credit. Thank you, your response was helpful! You're worrying about credit from past youth/cadet programs. You've been in CAP for a while now. Maybe focus on advancing to C/A1C. All I have left for A1c is my PT and drill test, so just waiting for my next squadron meeting. Awesome. Next stop is C/SrA. 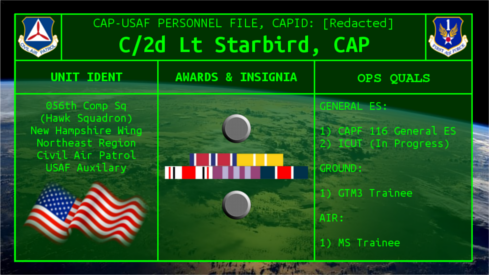 As someone who has done the accelerated promotion deal somewhat recently (between 5-9 years ago), I did great through til C/SMSgt and then started stalling out as I didn't have the full grasp on the program and the minute details and dedication required to make it to Spaatz. I missed important pieces of the program, partially because I was lucky enough to actually hit those bare minimums every month. To an extent I feel I might have made it past Earhart if I'd done it proper. Starting as an older cadet I thought it was great to move faster. I almost skipped encampment by using JROTC credit, and that would have been an even WORSE mistake. I was a C/Chief at encampment (which created challenges for me to remember my own place and remind the much younger flight staff of it as well, because my grade didn't matter) and it was the best time ever. And in your case it's irrelevant, because the answer is still no. But don't worry, this is better. The accelerated promotions for JROTC cadets have always been a mixed issue for me. On the one hand, sure, perhaps JROTC cadets have more experience... but the other part of me feels that CAP promotion minimums should be standard for all CAP cadets across the board, regardless of JROTC status. I can imagine a situation arising where ill feeling occurs because Cadet X thinks it is unfair that Cadet Y is eligible to promote twice as fast as them. I totally concur. Your experience in JROTC is not an equivalent to your experience in CAP. Now, there may be some crossover since both are leadership programs. A lot of what is learned in CAP applies elsewhere (and it's intended to, right out of the book). A lot of what is learned in JROTC applies in CAP. But the experiences are different. There is more to promotions in CAP than time-in-grade and having been taught under a leadership curriculum. What about duty performance? That all ties into your review (so being in JROTC allows you to move up faster, but it does not offset your review for every promotion). I know of cadets that have done both JROTC and CAP, and have done outstanding work in both; what I would consider to be examples of what a cadet should be. I know cadets who have done both and absolutely fail to adequately perform in their duty position in CAP as well as demonstrate leadership (but are promoted because their unit commander might see them as a token). So the regulations permitting rapid promotion may not be so much an issue, but there are supposed to be controls in place to prevent someone from promoting too fast. It needs to be closely watched, though. And when the senior member leadership fails to make that distinction, you have issues with that cadet, and it bleeds into other cadets who are affected by it.